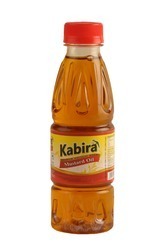 Kabira™ Kachchi Ghani Mustard Oilis manufacturedin a traditional way with modern techniques, where no chemicalsorand high temperature heating is been used. This helps to maintain the natural quality and aroma of oils. Widely recommended by health experts it contains least amount of saturated fatty acids, suitable omega 6 and omega 3 ratio and appropriate mixture of both monounsaturated polyunsaturated acids. Thus, they have high cholesterol reduction and anti-oxidant properties and several other essential health benefits. Kabira Kachchi Ghani Mustard Oilobtained from the kolus and first cold pressing of the finest quality mustard seeds, this oil is filtered to retain its naturally sharp flavor and pungent aroma. A high content of Monounsaturated Fatty Acids (MUFA 70%), along with Omegas 3 and 6, helps slowdown the aging process of body cells. The finished oil is packed in food grade 5 lts tin containers having Traditional India’s state of art designing works. 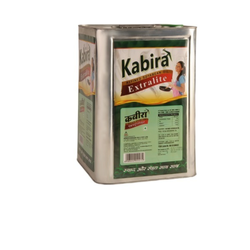 Kabira Mustard Oil with unique design virgin HDPE Jars is been developed to serve the packaging of 5 Ltrs Kabira Mustard Oil. The quality of jar is capable to preserve the naturality and pungent smell of Kachchi Ghani mustard oil. 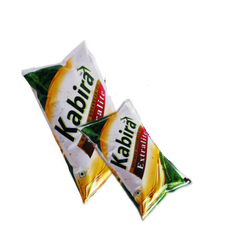 Kabira Mustard Oil is available in most advance nylon 5 layers Pouch Pack. The artistic design work of the pouch make it most attractive and the company also ensure that the pouch pack reaches consumers with 100% leakage free. A wholesale cartoon package contain twelve 900 ML pouches. 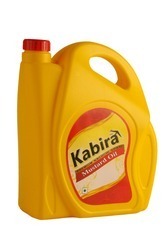 Kabira Mustard Oil is available in virgin 1ltr. , 900 (825+75)ml and 825 ml pet bottles The containers are packed in a most hygienic process to maintain the natural quality and aroma of the oil. 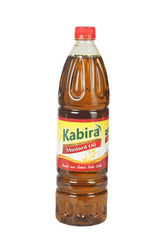 Kabira Mustard Oil is available in virgin 500ml or 450 ml pet bottle packed in a most hygienic process to maintain the natural quality and aroma of the oil. The unique cap design makes it almost leakage free. 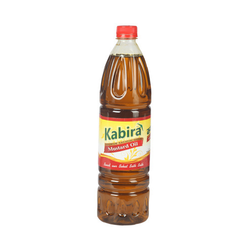 Kabira mustard oil is available in virgin 200ml or 175 ml pet bottle packed in the most hygienic process to maintain the natural quality and aroma of the oil. 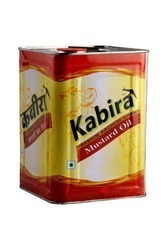 Kabira Mustard Oil is available in virgin food grade chrome plated tin of 15 Ltrs, packed in most hygienic process to maintain the natural quality and aroma of the oil. 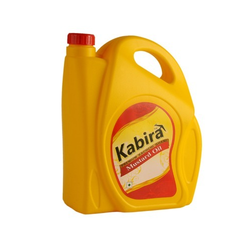 Kabira Mustard Oil is available in virgin 1710 ML HDPE Jar packed for export in the most hygienic process to maintain the natural quality and aroma of the oil.